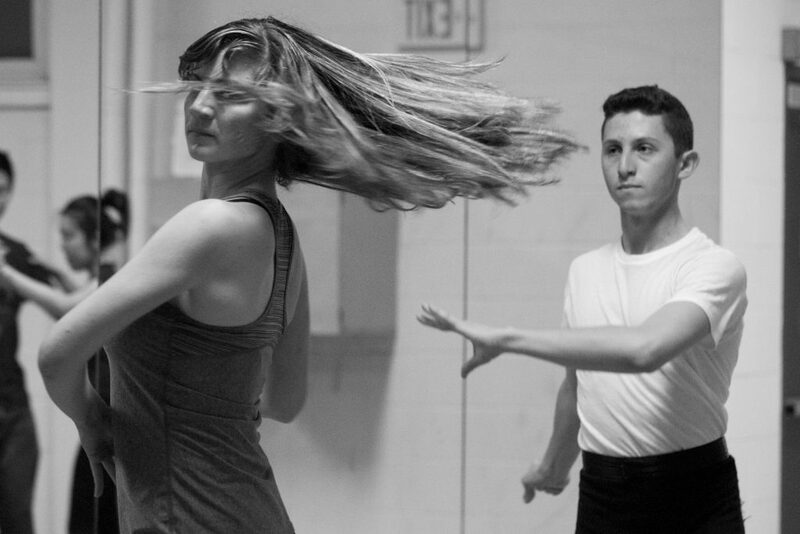 Julia Press / The Tufts Daily Archives Amanda Hutter and Max Greenhouse practice at a Tufts ballroom dance team rehearsal. Tufts Ballroom put on their showcase “A Night at the Movies” this past Friday. Full of glitz, glam, emotion and fun, here’s a recap of the student-run, student-choreographed showcase. “Pink Panther (Guest Swing Solo)”: The show opened with a guest couple performing a sultry, fun swing dance to a remix of the iconic Pink Panther franchise music. As professional dancers, this duo pulled off a unique, humorous take on a traditional form of dance often considered stuffy, which set the tone for the diversity of styles for the rest of the night. “Let Me Go (Bronze and Silver Latin Showdance)”: One of the larger performances of the night, “Let Me Go,” turned the tables from so-called “smooth/standard” ballroom style into Latin flair. Mixing rumba and samba styles, this ambitious undertaking was the work of sophomore Isabel Jiah-Yih Liao, the freshest face of the night’s choreographers. “Swinging Cats (Alumni Foxtrot Solo)”: Everybody wants to be a cat, especially Friday’s audience after having seen this adorable cat-eared foxtrot. Jazzy, quick and with some old Hollywood nostalgia, alumni Amanda Grace Hutter and Christian Testa turned out an adorable and much-welcomed return to the undergraduate ballroom life. “Hot Wings (Girl’s Cha-Cha)”: The ladies of this cha-cha routine were only able to practice together a few times before performing, which makes this premier especially impressive. Short black dresses and multi-colored bangles made for a classy, high-energy and Easter-appropriate affair. Choreography by senior Sarah Woodworth. “Jasmine Flowers (Guest Performance by Wuzee)”: Wuzee, Tufts’ only traditional Chinese dance group, joined in on the fun with a stunning flower-inspired piece. Incorporating grass-green gowns and vibrant pink fans, this different form of traditional dance ushered in springtime with some budding blooms and graceful sweeps of the arms. “Fuego (Alumni Samba Solo)”: In one of the steamiest numbers of the night, the ladies in this Latin couple’s dance showed that they didn’t come to play around. Twisting and turning with non-stop energy, this fuego was beyond fun, and the lead’s tasseled trousers were a wonderful touch. “Rainbow (Queer Latin Showdance)”: Ballroom dancing is seen as, and often still embodies, traditional gender roles and heteronormativity. In ballroom clubs today, this poses a problem in the face of teams that have more women than men, which is common, and of dancers that are interested in roles that wouldn’t typically be assigned to them. Complete with rainbow bows, this piece seems to call attention to the traditional constraints of ballroom tradition, and the wide-spreading joy and inclusivity this art form can show today. Choreography by alumna Emma DiFrancesco. “Falling Slowly (Senior Solo)”: This touching couple’s dance incorporated Rumba, Bolero and Foxtrot styles in a beautiful piece inspired by the score of the musical film “Once” (2007). In a night filled with high-energy moves and drama, this dance was a tender touch. “Once Upon a December (Viennese Waltz Showdance)”: This waltz was the second-largest performance of the night and, like the titular song, it recalls an epic ballroom part of turn-of-the-century Russia, Austria or France. The ending was punctuated by one of the nicest lifts and specialty moves of the night. Choreography by graduate student Megan Souza. “Super Serious Rumba (Leaders’ Special Performance)”: Dedicated to all the choreographers of this night’s show, the leaders of the partner dances came together to give their partners a show — “Magic Mike” (2012) style. This rumba (with music by Ginuwine) stripped the dancers of any of their stuffiness — and shirts. Choreography by Alison Faulk. “Wine From Your Tears (Alumni Viennese Waltz Solo)”: More alumni took the stage for this emotional couple’s waltz. The dance was, to an untrained eye, a more traditional-looking dance, but with indie singer Bishop Briggs in the background and black clothes, this piece formed a dark, stunning take on the Viennese Waltz. “Ding Dong the Witch is Dead (Silver Swing Showdance)”: This campy swing dance sets itself apart from all the other dances of the night with its flair. Although ballroom competitions don’t allow students to do lifts, there is no such rule in school showcases or performances such as this. With master choreography, this dance incorporated lifts, twirls, tumbles and drops in a fast-paced take of some wily witches. Choreography by junior Julia Bront. “Pirates of the Caribbean (Viennese Waltz Showdance)”: The finale of the night was, as the title might suggest, a full stage of swashbuckling and twirls, which surprisingly suites the Viennese Waltz. By the end, an Anne Bonny-style victory had been secured. Choreography by junior Stephanie Miller. Ballroom dancing isn’t typically considered a dance popular among millennials and has to face a lot of preconceived notions of the dances being boring, stuffy, sexist or dated. This showcase proved that this doesn’t have to be the case. Come to your friend’s ballroom competition or the next performance some time, and prepare to be dazzled.